The California Academy of Sciences is one of the top places to visit as a family. Not only has it been rated the “greenest” museum in the world, but the museum building itself is a huge 412,000 square feet architectural wonder! The roof is two and a half acres of “living roof” with real plants, the building has a solar canopy, the water goes through a reclamation system, and amazingly the walls are filled and insulated with old blue jeans. California Academy of Sciences is open Monday through Saturday from 9:30 am to 5 pm. 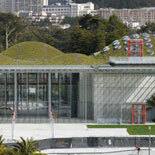 On Sunday the California Academy of Sciences opens at 11am and closes at 5pm. The California Academy of Sciences is only closed two days per year, on Thanksgiving day and Christmas day. If you decide to become of a member of the California Academy of Sciences you will be allowed to explore during hours that are not open to the regular public, on Tuesdays from 8:30 am-9:30 am and Sundays 10 am-11 am. The exhibits at the California Academy of Sciences are one of a kind offering a chance to see over 40,000 animals, which is more animals than many zoos have. Animals include everything from anacondas to Borneo fruit bats to a giant octopus. The museum has advanced technologies that allows you see to insects and animals as you have never seen them before. Children as well as adults will be amazed to see butterflies through a magnified net. Even though the California Academy of Sciences has been completely redesigned and modernized, they still have over 20 million specimens from past exhibits. Your kids will love seeing the T-Rex skeleton and exploring the swamp exhibit. All of the specimens and exhibits from the old version of the museum that are currently being displayed in the new California Academy of Sciences. Many of the structures from the original museum have been preserved in the new California Academy of Sciences. Also included in the California Academy of Sciences is access to the Steinhart Aquarium. See 38,000 aquatic animals and 900 different species from all over the globe. Your child will love seeing and learning about the African penguin, sharks, and piranhas. There is also a giant 100,000-gallon Northern California Coast tank that replicates the inhabitants of the Gulf of the Farallones National Marine Sanctuary. Have you ever been to the rainforest? California Academy of Sciences allows you to explore the living four story rainforest! Hear frogs croaking and exotic birds chirping as your family sees the rainforest like never before. There is an elevator that takes you down below the Amazonian flooded forest that allows you to see catfish swimming overhead. Not only will your family visually see what the rainforest looks like, but they will also “feel” what a rainforest feels like, with 75% humidity thanks to an overhead misting system and temperate between 82-85 degrees F.
The Kimball Natural History Museum is included in the California Academy of Sciences, and features many fun filled exhibits. Learn about Africa in the African Hall, the Islands Of Evolution exhibit will have you discovering the secluded islands of Madagascar and the Galapagos, and the Altered State will have you learning all about California and it’s climate. Your Academy of Sciences includes viewing of the skeletons; an 87-foot long blue whale skeleton, a giant T-Rex skeleton, and many others. There are special events and exhibits planned year round at the Academy of Sciences. Kids will have a blast learning, and adults will feel like they are kids again at the Academy of Sciences. Learn about other great Tours and Attractions. Copyright Trusted Tours of America, LLC. All rights reserved. Content from this Website may not used without written permission.